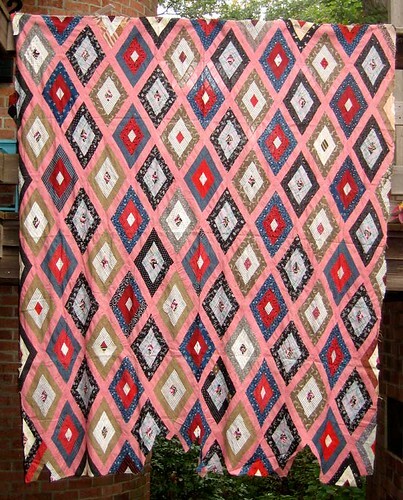 I'm expecting this quilt top to arrive in the next few days. I splurged and bought it simply because I thought the pattern was unusual and striking. I think the fabrics fall in the 1880s-1900s, probably skewing toward the earlier side of the period. I could be wrong, and would gracefully acquiesce if someone could demonstrate I am, but the indigos have that pretty pinpoint detailing and the shirting fabrics look right and those double pinks are just fun. I know, I know, it's really feminine. I've scrolled through my list of people who filled out the quilt form (did you do that, hint hint?) 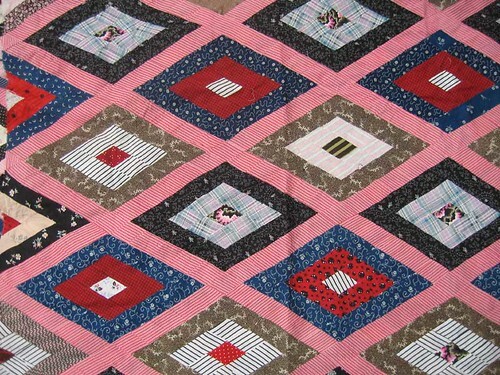 and for each person who said they liked the idea of a salvaged antique quilt, I just couldn't picture any of you with it. The one person I pinged, I did as a long shot, and sure enough it was too pink for her. I'd love to know who this quilt is supposed to be for, and even more so, I'd love to give it a slightly more dignified name than Chomp! Even though, admittedly, that's what's been done to the poor thing. When I ordered the fabrics for the quilt Tim commissioned from me, Lucy-Goosey, I asked the owner of http://reproductionfabrics.com to send me a couple of small scrap bags of fabric. 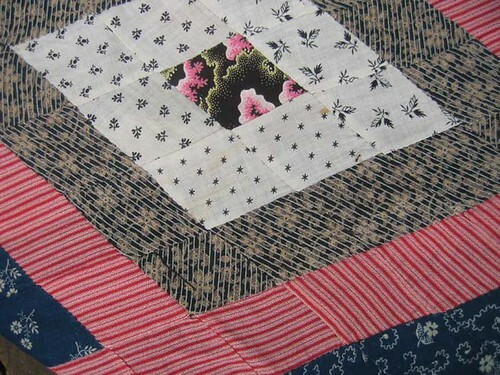 If I hadn't already had on-hand a set of scraps from around 1880, I'm not sure I would have bought this quilt top, but since I knew I already had most of what I needed to repair it, I felt pretty confident. The shirtings, which are the pale fabrics here, will be pretty easy to dovetail. My gut tells me that darker fabric in the middle is a fugitive purple that's fading to brown, but I won't know for certain until I get this fabric in my hands and look at it for myself. That double pink, though, is going to be almost impossible to get a good match for. I'll simply have to shop around and find a fabric that has a similar enough pattern that it 'reads' ok visually from a distance, and call it good. While it's a pity that this top was damaged like this, I wouldn't have been able to afford it if it hadn't been damaged. It's too old, and too good of condition, for it to be in my price range otherwise.